Trusted LASIK Surgeons launched its revolutionary Trusted LASIK Surgeons directory service and website at http://www.TrustedLASIKSurgeons.com in order to provide a resource for consumers seeking to improve their vision and find a highly qualified surgeon who can help improve their chances of attaining 20-20 vision. What sets the Trusted LASIK Surgeons directory apart is a unique screening process ensuring that only those who are among the best in LASIK eye surgery and laser eye surgery in the United States are listed. Refractive eye surgeons, such as Dr. Peter Rapoza, are screened based on their experience, research, publications, lectures, and patient care standards. Trusted LASIK Surgeons believes Doctor Rapoza's research, teaching, surgical skills, and other professional accomplishments place him among the top 1% of LASIK and refractive surgeons in the United States. His practice at Ophthalmic Consultants of Boston serves patients seeking vision correction surgery throughout New England, including Boston, Beverly and Waltham, surrounding states like Connecticut, New Hampshire and Vermont, as well as international clients. Boston LASIK Surgeon Peter Rapoza, M.D. at the VISX laser. Dr. Rapoza LASIK expert surgeon of Ophthalmic Consultants of Boston has extensive qualifications that we estimate place him among the top 1% of refractive eye surgeons in the United States. Dr. Rapoza offers a full range of vision correction surgery options, including laser vision surgery and lens implants. Our highly trained staff utilizes state of the art instrumentation. We believe in giving concierge-style service by a compassionate team in modern facilities which are easily accessible. Our patients become part of our practice family. Trusted LASIK Surgeons announced today that Boston LASIK Surgeon Peter Rapoza, M.D. having qualified for listing has joined the LASIK Surgeons Directory. Dr. Rapoza practice treats patients seeking LASIK eye surgery in Boston, Beverly and Waltham. Dr. Rapoza also treats those seeking vision correction surgery throughout Massachusetts, and in the surrounding states of Connecticut, New Hampshire Vermont, and Maine. The Trusted LASIK Surgeons directory seeks to list only those LASIK eye surgeons who are among the best in the United States by screening refractive surgeons based on experience, premier patient care, and professional accomplishments. In Trusted LASIK Surgeon's opinion, Dr. Rapoza has the experience and professional credentials that place him among the top 1% of LASIK and refractive eye surgeons in the United States. Dr. Rapoza's contributions and dedication to refractive eye care surgery set him apart from most LASIK Surgeons throughout the United States and he meets all of the screening criteria for listing in the Trusted LASIK Surgeons directory. Among them, he has been a principal investigator on several FDA studies for vision correction care as well as a co-investigator on others, has a faculty appointment at the Harvard Medical School in Boston as an Assistant Clinical Professor in its Department of Ophthalmology and is a member of the Department of Ophthalmology at the Tufts Medical Center. Dr. Rapoza has performed over 18,000 LASIK eye surgery and other laser vision correction procedures. Having over 21 years of experience in refractive surgery, including laser vision correction, lens implants and Intacs, this accomplished LASIK surgeon has the experience to help consumers obtain proper vision correction care. 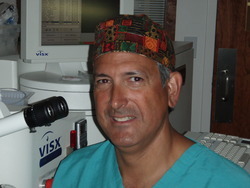 With over 250 lectures at major eye meetings throughout the world, authorship of over 30 textbook chapters, and the publication of over 30 articles for major peer-reviewed eye journals, Dr. Rapoza has the respect of his peers, who often seek out his opinions concerning patient care in the field of refractive surgery. Dr. Rapoza has a special interest in performing reconstructive eye surgery procedures for patients that have experienced suboptimal outcomes with prior surgeries. In addition, Dr. Rapoza has an extensive record of providing medical care and education in eye care throughout the world with special ties to Africa, Asia and the Middle East. Ophthalmic Consultants of Boston, one of the leading providers of eye care in the nation, offers comprehensive and premier patient care. Dr. Rapoza's refractive practice is located in the greater Boston area with offices in Boston, Beverly and Waltham. Patients from throughout New England, other parts of the United States and overseas consult Dr. Rapoza for their vision correction care. He treats patients with a variety of vision problems including nearsightedness (myopia), farsightedness (hyperopia), astigmatism (blurred vision), presbyopia, and cataracts. Ophthalmic Consultants of Boston uses the most modern equipment, including the IntraLase system for "All-Laser" or "Bladeless" LASIK and the Visx Star S4 Wavefront Based ("Custom") excimer laser for LASIK and PRK. Ophthalmic Consultants of Boston was one of the first centers to offer i-LASIK Diagnostic instrumentation includes the Pentacam and Visante systems. Dr. Rapoza provides a full range of refractive treatment options to patients beyond just LASIK and PRK, including lens implants, Intacs, limbal relaxing incisions, and cataract lens implants. Patients with complications from prior refractive surgery procedures performed by other eye doctors routinely come to him for corrective treatments. Given Dr. Rapoza's expertise in refractive eye surgery, it is no surprise that other doctors and eye specialists come to him for their LASIK or other vision correction procedures. Dr. Rapoza is a member of the American Academy of Ophthalmology, who has presented him with the Honor Award, the International Society of Refractive Surgery, and the American Society of Cataract and Refractive Surgery. He is active in local professional organizations including the Massachusetts Medical Society, Massachusetts Society of Eye Physicians and Surgeons and the New England Ophthalmological Society. Like all eye surgeons listed at Trusted LASIK Surgeons, he is board certified by the American Board of Ophthalmology. Peter Rapoza, M.D. has been named one of America's Top Ophthalmologists, one of the Best Doctors in America, one of the Best Doctors in Boston by Boston Magazine and is named in Who's Who in America. He has also been featured in CNN, Public Broadcasting and "Connie Chung's Eye to Eye". Dr. Rapoza is an avid sailor and is a captain licensed by the United States Coast Guard. He is a strong supporter of the Animal Rescue League of Boston with a particular interest in dog rescue and animal welfare. "Dr. Rapoza meets all of the inclusion criteria used by Trusted Lasik Surgeons," commented James J. Salz, M.D., CEO of Trusted LASIK Surgeons. "In addition, he has been active in training many refractive eye surgeons over his career. Ophthalmic Consultants of Boston, where Dr. Rapoza practices, is respected by ophthalmologists from all over the United States as the premier consulting group in Boston for complete and comprehensive eye care. Patients who require complicated refractive surgery procedures can be assured that Dr. Rapoza can provide the attention and treatment best for them." "Our team at Ophthalmic Consultants of Boston is honored to provide our patients with the highest quality of comprehensive vision correction surgery," stated Dr. Peter Rapoza. "Our highly trained staff utilizes state of the art instrumentation. We believe in giving concierge-style service by a compassionate team in modern facilities which are easily accessible. Our patients become part of our practice family. " Visit Boston, MA LASIK Surgeon profile page for Dr. Peter Rapoza at Trusted LASIK Surgeons. See Doctor Peter Rapoza's profile page at Ophthalmic Consultants of Boston in Massachusetts. To contact Dr. Rapoza's office directly, please visit the following link to the contact form and be sure to select Dr. Rapoza to ensure you see him: Ophthalmic Consultants of Boston Contact Form- Dr. Peter Rapoza in New England. The screening process and standards used by Trusted LASIK Surgeons are located at How Are LASIK Surgeons Qualified at Trusted LASIK Surgeons? To find a highly accomplished LASIK and refractive specialist in your local area who has been qualified and listed in the Trusted LASIK Surgeons directory, please visit Trusted LASIK Surgeons Directory . Trusted LASIK Surgeons, Inc. (Trusted LASIK Surgeons) is a premier LASIK, laser eye surgery, and refractive eye surgery directory service whose primary mission is to assist consumers in finding the best and most qualified LASIK and vision correction surgeons in their local area in the United States. To accomplish this, Trusted LASIK Surgeons uses a unique screening process where each prospective LASIK eye surgeon must meet the minimum required qualifications set by Trusted LASIK Surgeons. These qualifications for these doctors are based on experience (not just in LASIK but complete refractive care), research (including FDA approval studies for manufacturers and academic appointments at major universities), publications and lectures (to their peers, not to the public via infomercials) and patient care standards (treating other eye professionals and managing complications from patients first operated on by someone else). All refractive eye surgeons listed at Trusted LASIK Surgeons have qualified, been accepted, and have subscribed to our services. For more information on why we believe consumers interested in LASIK should consider an eye surgeon listed in the Trusted LASIK Surgeon's directory, please visit our website at http://www.TrustedLASIKSurgeons.com. Ophthalmic Consultants of Boston (OCB) was founded in 1969 with the primary goal of providing patients with eye care, laser and surgical treatment of the highest quality. In addition to eye examinations, our ophthalmologists provide care in the following specialties: cataract, glaucoma, cornea, diseases of the retina, orbital plastics, pediatrics, LASIK refractive surgery and eye trauma. Our staff of 26 ophthalmologists care for over 150,000 patients each year with all categories of eye disorders and visual system diseases. This level of care has earned Ophthalmic Consultants of Boston a national and international reputation for excellence. Ophthalmologists at OCB use the most advanced diagnostic, laser and surgical techniques available. Our physicians teach and lecture on a local, national and international level. OCB ophthalmologists are Board Certified and hold teaching appointments at Harvard Medical School, Tufts University School of Medicine and/or the Massachusetts Eye and Ear Infirmary. Our ophthalmologists are also published in numerous scientific journals and textbooks. OCB operates laser surgery centers in Boston, Waltham and Sandwich, Massachusetts. Astrid U. Rapoza, Dr. Med. Trusted LASIK SurgeonsAn online resource for consumers seeking better vision through LASIK and other refractive surgery procedures.